The 25th annual Screen Actors Guild Awards declared "Wakanda forever." WASHINGTON — Award season is no longer kryptonite for superheroes as “Black Panther” won the top prize at the 25th annual Screen Actors Guild Awards on Sunday in Los Angeles. 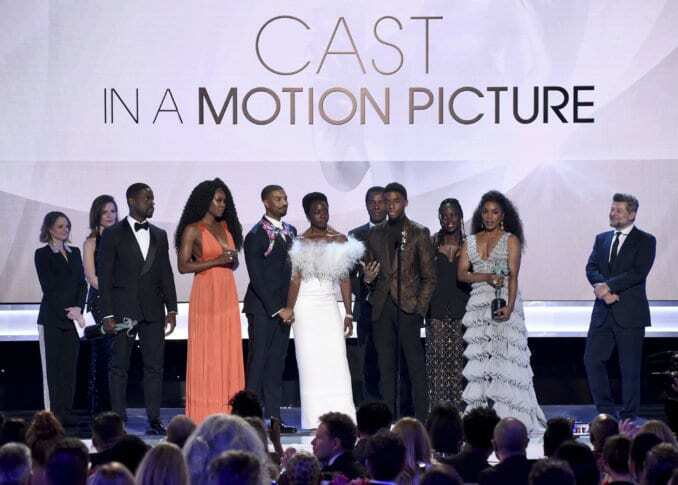 The Best Ensemble award honored the deep cast of Chadwick Boseman, Michael B. Jordan, Lupita Nyong’o, Danai Gurira and the rest of Wakanda in the year’s top-grossing movie. Can the Marvel superhero flick go the distance next month at the Oscars, where it is the first comic-book film ever nominated for Best Picture? With “A Star is Born” fading fast from contention, “Green Book” facing behind-the-scenes controversies and “Roma” needing to clear two historic hurdles (foreign language and streaming), it’s still entirely possible. In other categories, Rami Malek took Best Actor for his powerhouse performance as Freddie Mercury in the Queen biopic “Bohemian Rhapsody,” making him the front runner after his Golden Globe win. The SAG winner for Best Actor has won the Oscar 20 out of 24 times. Glenn Close won Best Actress for “The Wife,” moving another step closer to her first ever Oscar and effectively ending Lady Gaga’s chance at a late run at the prize for her “A Star is Born” breakthrough. The SAG winner for Best Actress has won the Oscar 18 out of 24 times. “The Marvelous Mrs. Maisel” won Best Comedy Ensemble, Best Actor for Tony Shaloub and Best Actress for Rachel Brosnahan.